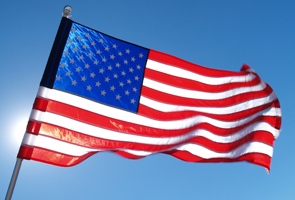 Attractive appearance, strength and durability are the main features that make nylon the ideal fabric for American Flags, thus making it most popular choice. Engineered nylon designed specifically to be ultimate colorfast and fastest drying great for use in all weather conditions. Its lightweight tight weave allow the flag to fly even in the gentlest breeze, assuring the fullest flowing visual effect.